There are many aliases associated with exzemoid dermatitis including scratches, pasture rot, rain scald, mud itch and grease heel. However, it generally spells trouble no matter what you call it. A combination of bacterial and fungal organisms cause scratches after they gain access to skin that is irritated. The sites that are commonly affected are the heel bulbs and the folds of skin on the back of the pastern area. Characteristics of horses with scratches are often oozing, red, inflamed and cracked skin. The transverse folds of the skin in this area are commonly affected by cracks which are red, irritated lines that appear like linear scratch marks, earning them their name. Unfortunately the problem is often made worse by the potions and remedies many owners use to treat the condition. The development of this problem is favored by moist conditions, so more cases are seen in rainy environments compared to dry or very cold locations. This condition can also be contributed to by poor stable management. Scratches can also be caused by rough pastures where horses can get small skin scraps from obstacles such as brush which breaks the defense layers of the skin and allow the bacteria and fungal organisms to start growing. Horses that are recently clipped can also lead to the situations since the infections can result from micro-cuts caused by the clipper blades that allow infection to begin. The biggest single factor in healing these infections successfully is often a change in stable and pasture management. It is very important to have clean, dry stalls and a safe pasture. It is also important to make sure the affected skin area is cleaned. Treatment should never include rough scrubbing and scab-picking since this can further irritate the skin and cause the bacteria and fungus to spread. A mild degreaser should be used to soak the area in order to soften and remove crusts. Similar products that work well during this stage of infection include mild dishwashing liquids, hand cleaners, hair conditioners and other similar products. These products should be in contact with the skin for fifteen to twenty minutes and then be well rinsed to remove all the scabs that can come off easily. The area will be completely cleaned after repeated applications over the course of a few days. Once rinsing is complete and the skin is completely dry you should apply an antifungal or antibacterial cream. For treating scratches a good option is over the counter preparations that are used for human athlete’s foot or yeast infections. In your particular area there may be a specific concoction made by your veterinarian since many of the bacterial and fungal combinations are specific to certain environments. Other important elements in clearing up scratches include sunlight and circulating air. The tissue is dried by sunlight which helps kill some fungi; without the presence of oxygen some types of bacteria and fungi can’t live. The leg may have to be wrapped daily if the infection is extensive. Don’t bandage scratches by your veterinarian since the may cause abrasion damage to the skin or become wet which can make the conditions worse. 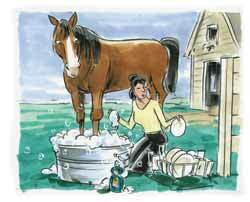 Simple care is all most horses with scratches need to improve. Too much misdirected attention is often the cause of complication in cases of scratches. When recognized early and treated properly, cases of scratches are not a major problem. Do not over medicate and pay attention to anything you can control such as cleaning the stalls and providing a good pasture. Read the next horse health tips article on Excess Salvia & Drooling.